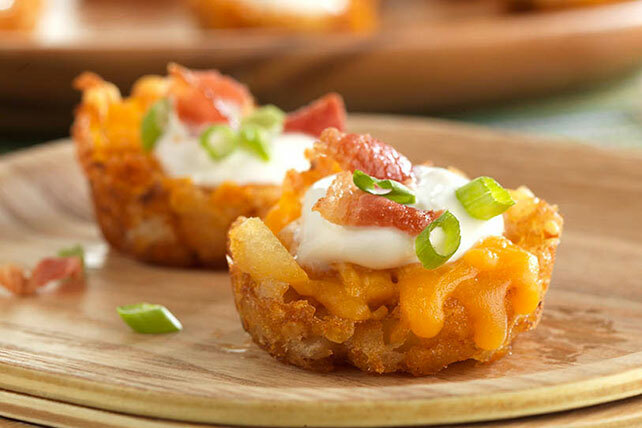 Start the party with a tasty TATER TOTS recipe that yields Mini Loaded TATER TOTS® Appetizers! Prep time for this TATER TOTS recipe is just 15 minutes. Place 2 TATER TOTS in each of 24 mini muffin pan cups sprayed with cooking spray; place on bottom oven rack. Bake 10 min. Spray bottom of shot glass with cooking spray. Use (in twisting motion) to press TATER TOTS in each muffin cup to make potato cup. Return to oven; bake additional 15 min. or until deep golden brown. Add cheese to potato cups; bake 1 min. or until melted. Transfer to platter; fill with remaining ingredients. Spoon sour cream into small resealable plastic bag. Cut small piece off one bottom corner of bag. Use to pipe sour cream into potato cups before topping with bacon and green onions. If you don't have a shot glass, you can instead use the back of a large metal spoon to press the partially baked TATER TOTS in muffin pan to form potato cups.